This article was originally published at 13:15 SGT on Tuesday; it has since been updated. Shares of M1 gained ground on Tuesday, outperforming its Singapore-listed peers, after earnings were in line with expectations and showed signs the telco’s new initiatives might bear fruit. The stock was up 1.12 percent at S$1.81 at 1:09 P.M. SGT on Tuesday, off its earlier high of S$1.82; that was outperforming rival StarHub’s 0.43 percent fall and the STI’s 0.23 percent rise. With buy orders clustered around S$1.81 and sell orders around S$1.82, the stock may be stuck in a rut. CIMB tipped a good entry point at below S$1.50, its bear case, and a good exit point as above S$2.10, its bull case. The telco reported its first-quarter net profit was stable at S$34.8 million on-year and up 8.3 percent on-quarter. Service revenue rose 3.0 percent on-year to S$184.7 million on higher fixed-line — both in the residential and corporate segments — and postpaid revenue. M1 said contributions from mobile data rose to 61.3 percent of service revenue, up from 54 percent a year earlier. That could be viewed as a confirmation of the telco’s efforts to shift its revenue mix away from text messages and voice, which have been waning. DBS said the results showed a “positive surprise” from the Circles.Life partnership and mobile data revenue, noting the headline net profit figure was around 6-7 percent above consensus forecasts. The bank said it expected consensus forecasts for 2018-19 earnings and dividends to rise by 5-10 percent, but it kept a Hold call with a S$1.76 target price. OCBC said in a note on Tuesday that M1 was “gaining traction” in its non-retail businesses. 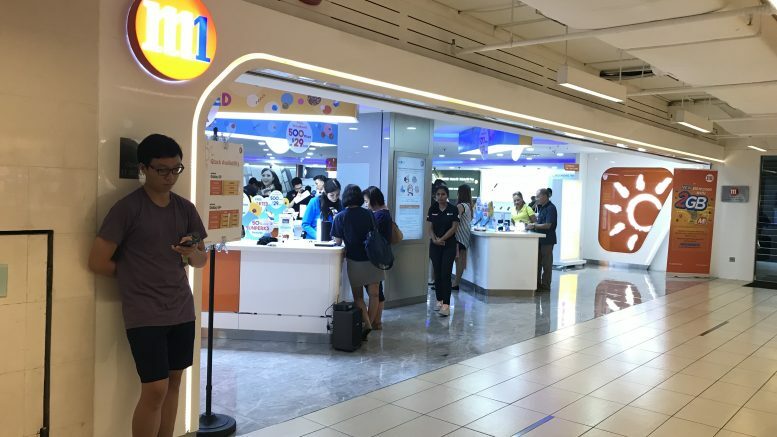 Outside of the retail business, M1 was “building its foundation” for the 5G network rollout, OCBC said, adding it expected M1 to continue to land corporate and government fixed-line business. But it added, the headwinds were strong and it was sticking with a Hold call and S$1.70 fair value. RHB also saw the results as broadly in line with expectations, with the fixed services a “bright spot” and mobile revenue momentum supported by the Circles.Life deal. The brokerage did point to a sharp 59,000 net deletion from M1’s prepaid base, which management attributed to rivals’ use of incentives to grab market share in the quarter, which M1 decided not to reciprocate. RHB kept a Neutral call, with a S$1.95 target price. It noted that the stock price was trading at enterprise value to EBITDA valuations that were below its historical averages, while the stock should get support from a prospective dividend yield above 6 percent. EBITDA stands for earnings before interest, tax, depreciation and amortization.